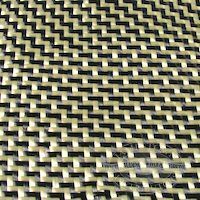 Carbon Kevlar Twill Weave is a twill woven blend of carbon fiber strands with Aramid Kevlar strands. It is fairly lightweight at 7.0 oz. / sq. yd., and is usually 50 inches wide. 2x2 Twill Weave. This cloth drapes easily, combines high strength and durability of both fabrics, and is used commonly for cosmetic parts. The item was added to your wishlist. The item was added to your shop cart. Can i get different colors ? The color does not change when applied. They do not offer another color, I belive tou may be able to tint the resin to change the color. This is not bullet proof. hello good day is the carbon kevlar cloth measures 1yard leght and 1yard in witdh thanx? they are sold 50 inches wide x 1 yard long.